28 Mar 2016 Are We on the Brink of Assad’s Final Days? A Kremlin aide said on Monday that U.S. President Donald Trump suggested the White House as the venue for a summit with Russia’s Vladimir Putin. It happened when they discussed the idea of meeting in a telephone call last month. Possible Trump Putin meeting venue? Trump suggested The White House. Since that call, on March 20, preparations for a possible summit have not progressed because of a diplomatic row, the aide, Yuri Ushakov, said. When our presidents spoke on the phone, Trump proposed having the first meeting in Washington, in the White House. Trump called Putin last month to congratulate him on his election victory. He told reporters he believed he and Putin would meet “in the not too distant future. White House press secretary Sarah Sanders did not confirm an invitation had been issued to Putin, but said the two had discussed a number of venues for a potential meeting, including the White House. “We have nothing further to add at this time,” she told reporters on Monday. Rolling out a welcome for Putin in the White House, rather than at a neutral location, could anger Trump’s domestic critics, who accuse Russia of hostile acts against Western countries, including the United States. Some current and former members of Trump’s team are under investigation for alleged collusion with Russia. 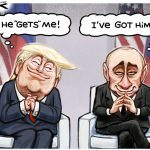 Trump denies any collusion. Since the March 20 phone call, Washington expelled 60 Russian diplomats and closed a Russian consulate over allegations that Russia was behind the poisoning of former Russian spy and his daughter in Britain. If the meeting takes place at the White House, many in the U.S. intel community would go out of their way to deliver false intelligence to Trump just in case he shares it with Putin to demonstrate how important he is.